Greece's snap election took place on the 25th of January, and the result was a change of government. The New Democracy-PASOK (Panhellenic Socialist Movement) coalition government was defeated, and was replaced by a SYRIZA-Independent Greeks coalition government. What this will mean for Greece's economic future is still unclear: however, the election itself has proved to be an interesting contest. The result of the election is below. All parties that held seats before dissolution or won seats are listed below. Seat changes are calculated on the basis of the seat distribution on the 6th of January. Greek election results (click on picture for larger size). Note: Seat change will not add up to zero, as the Independent Democratic Group of MPs did not contest the election. Democratic Left total is total for Democratic Left-Green coalition. The above graph is not strictly in order, as the Democratic Socialist Movement and Democratic Left are seperated by four parties, but this is not really relevant. As I have explained before, Greece uses a system of bonus-adjusted proportional representation. Votes are cast for parties, and the party with the most votes is awarded 50 seats. The remaining 250 seats are distributed amongst parties with over 3% of the vote using proportional representation. This usually means that the largest party has enough of an advantage in terms of seats to form government. If the 50 seat bonus were abolished and all 300 seats were distributed through proportional representation, SYRIZA and Independent Greeks would have just 135 seats; not enough for a majority. SYRIZA: The last five years have seen a meteoric rise for SYRIZA. From just 6 parliamentary seats in 2004, the party has grown to nearly have an overall majority in Greece's parliament. However, such a meteoric rise could possibly lead to a dramatic collapse of support if SYRIZA fail to properly implement their promises. The possibility of such a collapse must worry Alexis Tsipras somewhat. However, SYRIZA managed to harness anti-austerity sentiment extremely well, and they managed to win government despite a small original support base. New Democracy: Being viewed as the 'party of austerity' has cost the New Democracy party dearly. While 2015 was not their worst performance (that honour belongs to their result in May 2012, when they won just 19% of the vote), it is a poor result for a party that until 2009 had never fallen below 35% of the vote in its history. However, they have managed to keep control of the centre-right vote, which their centre-left counterpart PASOK failed to do. They are also in a strong position to return to government if SYRIZA falls over. Golden Dawn: This party, one of the few European parliamentary parties deserving of the title 'neo-Nazi', has received a lot of international media attention. However, their performance in this election was rather poor, and it appears that they have hit the ceiling. This is a good thing for Greece; along with the Communists, Golden Dawn were refusing to negotiate with any other party to form government, and Greece does not need more obstructionist MPs. This is not to mention their extremist stances on racial issues. To Potami: This liberal centrist party has performed extremely well in this election, especially considering the poor performances of liberal parties in Greece during the recession. This may be due to the anti-corruption image of leader and TV journalist Stavros Theodokrais, a factor lacking for other recession liberal groups. To Potami was a possible government coalition partner for SYRIZA, but was rejected. Communist Party: Despite doing nothing at all for the entire recession (other than writing snarky rants on their English-language website), the Communist Party managed to make a fractional gain. This may be a bounce-back after their unusually poor performance in late 2012; nonetheless, the Communists have lost significant support to SYRIZA during the recession, perhaps as a backlash against the Communist Party's refusal to enter government with, well, anyone. Independent Greeks: The right-wing soft nationalist anti-austerity Independent Greeks party performed poorly in this election. After a promising start in May 2012, when they won 10% of the vote, the party lost support in the June election, and lost support again in 2015. However, they will be in government, after SYRIZA decided to enter into a coalition with them, in a move that perhaps signals a more Eurosceptic stance of the new government. PASOK: Poor old PASOK. Once one of Greece's most powerful parties, this centre-left party has fallen to being the least popular party in the Greek parliament. Most of the party's leftist credentials have disappeared after their coalition with New Democracy. A stint in opposition will allow them to rebuild those credentials, and perhaps return to power at some later stage if SYRIZA fails. The others: The Democratic Socialist Movement, which was formed by former PASOK Prime Minister George Papandreou, failed to pass the threshold by 0.5%. This is somewhat historic for Greece; the Papandreous have provided three prime ministers for PASOK. The little parties didn't do very well, other than a relatively good result for the Union of Centrists (a hangover from the 1960s). Democratic Left, a centre-left party who entered the government in 2012 but left in protest against the closure of the national broadcaster, collapsed, winning only 0.49% in coalition with the Greens. This is even worse considering that the Greens won 0.5% of the vote at the European elections in 2014. SYRIZA have previously indicated a desire to change Greece's electoral system to pure proportional representation, abolishing the 3% threshold and the 50 seat bonus. Such a system would give the following results. While government formation would be complicated, it would be possible. However, the extreme fragmentation that this system would cause may mean that SYRIZA will need little encouragement to put this idea on the shelf. It is still unclear what SYRIZA will do for Greece in the long term. However, it seems that the government will be relatively stable in the short term. As has been discussed on this blog before, Queensland will be holding a state election on the 31st of January. Opinion polls have generally pointed to a narrow win by the Liberal National Party. However, what is more precarious is the situation of Premier Campbell Newman. Newman is the member of Parliament for Ashgrove. Ashgrove is a inner Brisbane seat that was held by the Labor Party from 1989 to 2012. When Newman was elected opposition leader in 2011, he was mayor of Brisbane, and did not hold a parliamentary seat. Jeff Seeney, Newman's deputy, was elected interim opposition leader. At the 2012 election, Newman decided to contest Ashgrove, despite it being a fairly safe Labor seat. It was held by Kate Jones, the Environment Minister, on a 7% margin. On election night, however, Newman won easily. A 12% swing towards him allowed him to win with 55% of the two-party preferred vote. Newman did not actually reside in Ashgrove, but it was his closest winnable seat. However, the 2015 election will provide a challenge for Newman. Statewide polls suggest that Ashgrove is likely to be a very close contest. Kate Jones is contesting Ashgrove as the Labor candidate. A number of electorate-only polls have been taken in Ashgrove. All recent polls have shown Jones with a lead over Newman; however, that lead has decreased recently. The Liberal National Party have promised $18 million for improvements to Ashgrove services, and perhaps a sense of 'money before party' has come over swinging Ashgrove voters. If, however, Newman is defeated in Ashgrove, but his Liberal National Party wins the election, he has two options. While it is possible to serve as Premier for a short time without a parliamentary seat, if Newman did not want to seek another seat, this would be the most likely option. When leaders of parliamentary parties lose their seats, it is usually because their parties have lost an election. Losing an election usually means that parties do not want to keep their current leader. For example, in Australia's 2007 federal election, Liberal Prime Minister John Howard was defeated by Labor candidate Maxine McKew in his seat of Bennelong. The Liberals lost that election, meaning that Howard would not have been Prime Minister even if he had won Bennelong. Howard resigned as Liberal leader, and did not attempt to contest another constituency. I don't know any case of a leader whose party won an election but lost his own seat resigning as leader. If anyone knows one, please comment. In this scenario, Newman would request that a Liberal National backbencher in a safe seat resign, and he would run in a by-election to replace that member. In the event of a Liberal National victory, but a Newman loss, this is the most likely scenario. There are plenty of rural safe seats with backbenchers that Newman can run in, and there is no residency requirement in Queensland's electoral law. However, this is somewhat unprecedented for Australia, and I can't find any leader who was defeated in their own seat but won in the general election. However, Canada has had a number of cases of this. In the 2013 British Columbia election, the centre-right Liberal government of Christy Clark defeated the centre-left New Democratic Party led by Adrian Dix. However, Clark was defeated in her electoral district of Vancouver-Point Grey by a NDP candidate, and had to contest a by-election in a safe Liberal district. It has also happened in Alberta. If the Liberal Nationals win, but Newman loses, it will be a first for Australia (as far as I know). However, there is no real possibility of a constitutional crisis; the scenario is well prepared for. Queensland election 2015: Newman, Palaszczuk, and GetUp! Queensland will be heading to the polls on the 31st of January, to elect all 89 seats of the state's unicameral Parliament. Members will be elected in single-member constituencies using optional-preferential voting. The election was announced by Premier Campbell Newman on the 6th of January in the face of multiple poor opinion polls for Newman and his Liberal National Party. For 32 years, Queensland was governed by the National Party, a conservative, rurally oriented party. The Nationals mostly governed in coalition with the Liberal Party, a conservative, urban based party. For most of those 32 years, the government was run by Sir Joh Bjelke-Petersen, a peanut farmer from Kingaroy, a rural town in the state's south-east. Bjelke-Petersen ruled for nearly 20 years, and introduced a number of controversial policies during that time. However, in 1987 Bjelke-Petersen was forced to resign after a number of corruption scandals involving his government were uncovered. Bjelke-Petersen was preceded by Mike Ahern and Russell Cooper, who failed to make much of an impact. In the 1989 election, Cooper and his Nationals were defeated by the Labor Party, led by Wayne Goss. Goss led the state for 7 years, and introduced a number of anti-corruption reforms during that period. He was comfortably re-elected in 1992, but was returned to office only narrowly in 1995, and the overturning of a result in one seat and its subsequent gain by the Liberals allowed the Liberal National coalition, led by Rob Borbidge, to gain office in early 1996. Borbidge's government was relatively unsuccessful, and a number of scandals and missteps by the government led to the Coalition's defeat at the 2001 election by the Labor party, led by Peter Beattie. The 2001 election was notable for the rise of the One Nation party, a radical right party founded by Pauline Hanson. One Nation won 11 seats, but soon disintegrated due to infighting and splits, and won only 3 seats in 2001 and 1 seat in 2004. Beattie led Queensland for 9 years, comfortably winning every election. In 2007, he handed over to his deputy, Anna Bligh, who won the 2009 election comfortably, becoming the first woman ever elected to lead an Australian state. However, at the 2009 election, the Liberal and National parties had merged into the creatively named Liberal National Party. Bligh's second term, however, was not successful. A number of scandals and controversial , privatisations not announced in 2009 dramatically reduced her popularity, and the Labor Party was defeated with a massive swing of 15% against them, and the loss of 44 seats. The Liberal National Party (LNP), led by Brisbane Lord Mayor Campbell Newman, won, with a record majority. Labor won just 7 seats. Newman, however, has governed in a rather divisive manner. Anti-motorcycle gang legislation introduced by Newman has been accused of being overly strict, and a large number of civil servants have lost their jobs. Legal appointments made by the Newman government have been sharply criticised by many in the Queensland community. As a result, the Newman government goes into the 2015 election in a far poorer state than in 2012. The Labor Party has fared relatively well in Opposition, despite a small caucus. The Newman government stands to lose a large amount of seats. This cannot come as a surprise, given that a significant number of seats won by the government were won due to anger at the Bligh government, which will not be much of a factor at this election. However, most opinion polls have shown them with a narrow lead, and it is relatively likely that they will be returned with a small majority. More interesting is the potential fate of Newman himself. He is the member for the seat of Ashgrove, which was held by Labor from 1995 to 2012. Newman wanted to run in a local seat, and won Ashgrove in 2012 with a 12% swing. He now holds it on a 5% margin. This is a winnable seat for Labor. It is being contested for Labor by Kate Jones, who was the MP for Ashgrove from 2006 to 2012. If Newman loses, but his party wins, he will either have to force an MP to resign so he can run in a by-election, or resign as Premier. Labor has done well over the past three years. Leader Annastacia Palaszczuk has done relatively well for a state opposition leader, and her party is likely to make significant gains. However, it seems that Labor will fall short, although it is not impossible that they win. A number of small parties will be contesting this election. The Palmer United Party, a political party founded by Queensland mining millionaire Clive Palmer, may win a few seats, although that party has been hit with a number of controversies recently. Bob Katter's conservative Katter's Australian Party will likely lose all of its seats, after a poor performance in the 2013 federal election. The Greens are weak in Queensland, and won't win anything. Perennial loser Pauline Hanson will make a run for the safe Liberal National seat of Lockyer; she probably won't win. 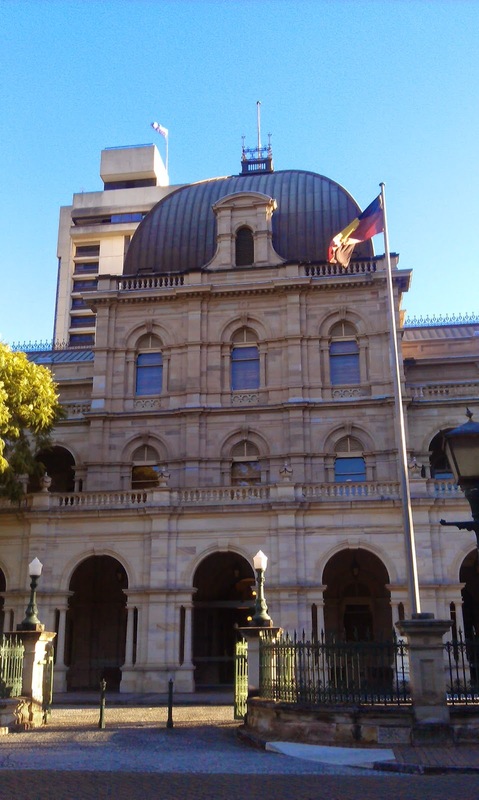 In early 2014, the Newman government passed a number of changes to Queensland's Electoral Act. These changes were relatively controversial, but one of the ones that attracted the most attention was a requirement that voters present identification in order to cast an ordinary vote. For those who are unaware, in Australia, voters must not present ID for any election. They register before an election, and their names are placed upon a roll that is distributed to every polling place in a constituency. In order to vote, a person needs to have their name not crossed off the roll at the polling place at which they want to vote. While this may seem open to fraud, most cases of multiple voting in Australia tend to be accidental in nature. However, the rationale aside, the law has been introduced, and will be used for this election. The activist group GetUp!, which tends to support left-wing causes, has led a campaign against the law, and they have led a campaign to put advertisements in the Brisbane newspaper attacking the changes. 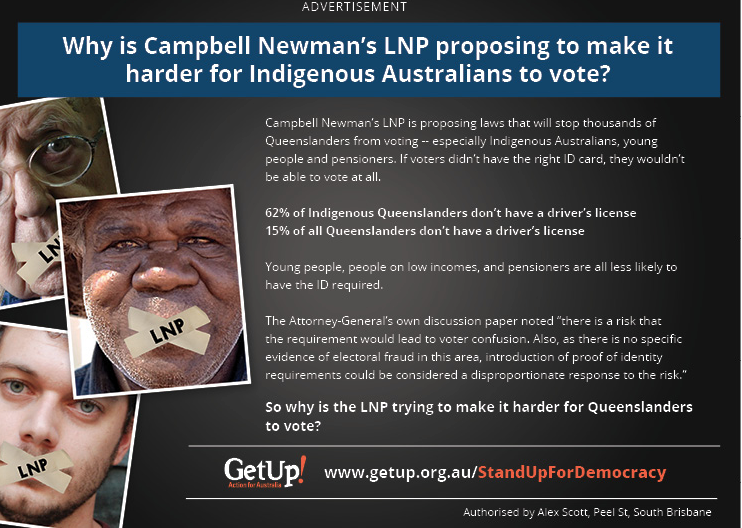 One of the ads is reproduced below (I am not aware if these ads were printed, but they are on GetUp! 's website). Click on the ad for a close-up. This ad has a number of problems. First of all, the driver's license statistics are a complete non sequitur; a driver's license is but one of many documents that can be presented in order to vote. Antony Green's blog has a list of documents that voters can use. It includes telephone bills, local council rates notices, and Medicare cards. Secondly, and more seriously, this ad may be in breach of Queensland's Electoral Act. The ad runs into trouble in its choice of wording: it claims that "if voters don't have the right ID card, they won't be able to vote at all". This is simply not true. Voters may not cast an ordinary vote without ID. However, they may still cast a declaration vote. The difference is clear. If a voter casts an ordinary vote, their vote is simply placed into the ballot box, as the polling officers have determined that that person is on the rolls and has ID (in Queensland). However, in Queensland, if a voter does not have ID, but is on the electoral roll, they will be told to cast a declaration vote. A declaration vote involves a voter casting a vote, but then placing it in an envelope. The voter then fills out a form, which is attached to the envelope. After the election, the form is examined. If the voter was eligible to cast a vote, the envelope is opened and the vote is counted. If not, the envelope is thrown away. Australian electoral law contains specific prohibition against misleading voters. Below, I have reproduced Section 185 of Queensland's Electoral Act, which deals with misleading voters. regarding the personal character or conduct of the candidate. other than in accordance with this Act. Now, I am not a lawyer, and this is not legal advice. However, the GetUp! ad, which is still on their website here, seems like it might run afoul of this piece of law, given that it tells voters that they will be completely barred from voting without ID when this is not the case. This section of law is rarely enforced. It was used in 1996, against a man named Albert Langer. Langer had published a booklet encouraging voters to give equal last preferences to candidates that they disliked equally, which is illegal. Langer was sentenced to 10 weeks in prison, which was later reduced to 3 on appeal. In Queensland, 40 penalty units is equal to $4554 Australian dollars. This is a very harsh fine, and the full penalty would be unlikely to be levied against GetUp! if the case were to be tried and the group were to be found guilty (and I won't be making a complaint against the group; in my humble opinion, this section is way too open to be used in such a way). I have nothing against GetUp! ; ironically, this may be an own goal, given that it may frighten left-leaning voters without a driver's license away from the polls. So, Queenslanders who are reading my blog (a small group), when you go to vote, take some ID mentioned in Antony Green's blog post to speed things up, but if you do not have any of this ID, you can still vote. For more information about Queensland's election, visit Dr Kevin Bonham's blog for polls and the ABC election website for news.